Dr Nadia Bellofiore has received the second-highest honour, the 2018 Vice Chancellor’s Commendation for Thesis Excellence, from Monash University for her PhD thesis. Dr Bellofiore’s award recognises world-leading research undertaken by a student. 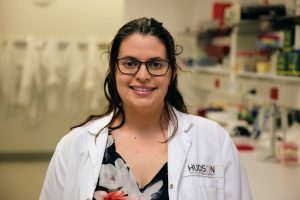 Currently a Postdoctoral Scientist in Dr Stacey Ellery’s research group at Hudson Institute, and previously under the supervision of Dr Jemma Evans, her thesis, Discovery and characterisation of the first menstruating rodent: The spiny mouse for use as an in vivo model of reproductive biology, has already resulted in five published papers. Nadia described the honour as a wonderful feeling. “To come to the end of that PhD journey and be recognised at such a high level is incredible. There are so many sleepless nights and, particularly in medical research, you’re always doing something new and never sure if it will work. So, it’s a wonderful achievement for me,” Nadia said. Nadia paid tribute to her three supervisors: Dr Jemma Evans, Dr Fiona Cousins and Associate Professor Peter Temple-Smith (Monash University). “The only reason I’ve been able to get this far is because of them. This award is really a testament to their endless support, both professionally and personally. 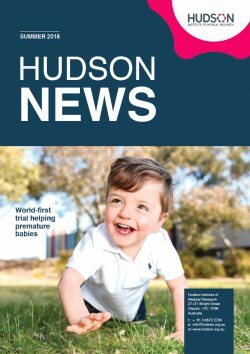 I was very fortunate to be a student of Hudson Institute and Monash University and meet these incredible scientists, who still continue to mentor me now,” she said. Dr Bellofiore’s 2015 discovery that spiny mouse, native to the deserts of Africa and Middle East, menstruates for approximately 72 hours every nine days. Her research has generated significant interest from scientists worldwide. Until then, it was largely believed that no rodent species menstruated. Dr Bellofiore is continuing her career as scientist with Hudson Institute. Her research is now focused on understanding whether the spiny mouse could be a useful preclinical model for understanding female fertility, particular menstrual disorders and pregnancy complications. “Our initial discovery of menstruation in the spiny mouse was completely unique, and our work exploring the physiology of their menstrual cycle continues to be world-first,” she says. Could this be the end for PMS? This news article was posted on 11 April, 2019 .